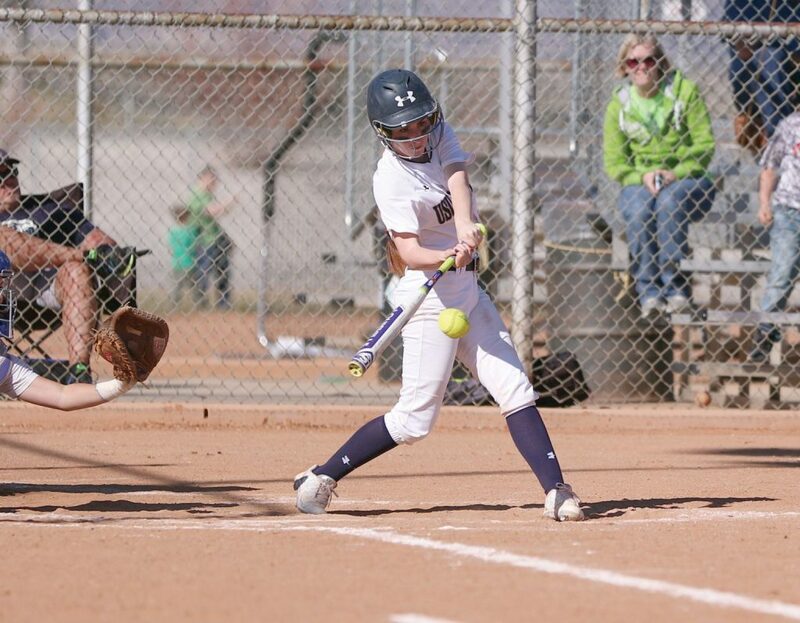 The Utah State Eastern softball team picked up its first home victory of the season on Saturday, April 1 by defeating the Snow College Badger 13-5 in six innings. Before getting the win, the Eagles played a doubleheader on Friday despite some bad weather which caused a delay in game one. In game one the Eagles had an 8-4 lead going into the top of the sixth behind the bats of Cassidy Howe, Cheyenne Pratt and Sierrah Anderson. Howe led the Eagles with four RBIs, two runs and one-home run in game one. Anderson had two RBIs, two runs and drew two walks. The Eagles gave up three runs in the 6th and 7th inning to allow the Badgers to grab the 10-9 victory. Snow kept their bats alive in game two on Friday with outscoring the Eagles 19-1 to sweep the Eagles on Friday. The Eagles started the game scoring their two runs in the bottom of the first inning. In the next two innings however, they gave up five runs to give the Badgers a 10-2 lead after three innings. To prevent the Badgers from a series sweep, the Eagles pulled through in game four to get their first-home victory of the season. Howe led the Eagles with five hits with a double, two runs and one RBI. Pratt led the Eagles in RBIs with three off two hits in five at bats. Taylor Casaquito and Alex Burrola each contributed to the offensive surge in game four, each had two hits. The Eagles also got a huge lift from Alexis Mendenhall in game four after she had two hits and five RBIs. As a team, the Eagles had 18 hits, three strikeouts and eight runners left on base. Aston Bell picked up the win for the Eagles after pitching five innings. With the win, the Eagles snap a 17-game losing streak and are only three games back of Colorado Northwestern for fourth place in the Scenic West Athletic Conference standings. Howe leads the team with a .418 batting average and RBIs with 16. Both Howe and Anderson lead the team with four-home runs so far this season. The Eagles look to build off their win against Snow this coming weekend with a four-game series at home against Colorado Northwestern. First pitch for both days will begin at 1 p.m. at the Utah State Eastern Softball Field. Fans can also watch the games online at the Utah State Eastern YouTube channel.